I grew up in southeastern Virginia in the 1960s. We had a house set in an area that had once been a kind of bog. The fetid, red earth had been cleared of stumps and underbrush, the mosquitoed water drained, and then houses built. Our house was by a brackish, dark lake, about a mile inland from the Atlantic Ocean. The lake fed into a bigger brackish lake that eventually fed into Chesapeake Bay, the delicate estuary on the east coast of the United States that separates Virginia and Maryland. In the lake, on its murky bottom, roamed crabs. Not ordinary crabs. Big, blue-clawed crabs. They were highly prized by our family—and by seafood stores—for their savory meat. We had a small boat, and every few days, my younger brother and I went after them. Near where we lived was steamy marsh—spongy earth covered with high, rigid-bladed grass. Through this primordial muck ran channels, about two feet wide, almost perfectly straight—so straight, in fact, it seemed as if they’d been made by a machine. There seemed to be no purpose to them, at least none that I knew. They were too narrow for a boat to navigate. On scalding summer days in the 1960s, my brother and I would station our boat at the mouth of one of those channels that ran into the dark lake. We knew from experience that this was where crabs lingered in numbers. Crabs are caught in two ways: with a trap or with a line. Catching crabs with a trap is not crabbing, in my opinion, just as I don’t think catching fish with a net is fishing—it’s something else. It’s commerce. Catching crabs with a line is true crabbing. It’s simple and easy, and anyone can do it. You do not have to possess any kind of skill. The equipment is minimal. All you need is some line—loose kite-strength string will do—a sinker, a net, a bucket, and some bait (chicken necks preferred, but bacon works, or any meat scraps). You can crab from the shore, but it’s better to have a boat because you can get to places where crabs lurk that you otherwise couldn’t. Crabs, unlike trout—to take a familiar fish—are not very wily. This fact alone makes crabbing fundamentally different than, say, fly fishing. There are no legends in crabbing. There is no “Big Blue” people have been trying for years to catch but never could because he was too clever even for the most skilled crabbers. Any crab can be caught by almost anyone. Crabbing doesn’t require the absurd, costly Abercrombie & Fitch dude outfits that some fly fishermen must have along with 60 hand-fashioned designer flies for every minute of the day. Not to mention how much the truly dedicated will pay for an officious guide who makes them feel as if they can’t peel an apple, much less catch a fish. Crabbing, then, is the most democratic of sports, if you want to call it a sport. Crabbing is a summer affair, and my brother and I tried to get to our spot before nine o’clock so that we wouldn’t have to face the merciless Virginia sun at its zenith. By 11 it was hard going, even for us who were used to the predatory heat. We would throw our anchor onto the swampy shore at the head of one of those narrow channels. Then we’d fill our buckets with the warm brackish water from the lake. We had to put the crabs we caught into the water from which they came—not, say, into fresh water brought from home—or they would die. Crabbing was a perfect pursuit for us. We were in our mid-teens—my brother 14 and me 15—and so we were old enough to use the motor-powered boat on our own but not yet able to drive a car. We had what boys our age wanted most—freedom and authority. For a few hours, we were masters of our own destiny and out of the reach of discipline and direction. From living in the sun all summer long, on the beach and on the lake, we were tanned and fit and a little wild. For a morning at least, we were out on our own, cut off from the ordinary world. It was sublime. Once properly stationed, we would throw our lines overboard, two to a side. The water was normally somewhere between three to five feet deep. We couldn’t see much beyond the surface of the murky lake. With our lines resting on the bottom, we breathed the heavy heat rising from the land’s surface and waited. We could hear countless insects creating a steady, rising hiss. We might see a green heron picking its way delicately along the shore. It walked cautiously, as if it were wading in something disagreeable. We might see a snake, turtles. That such an uninhabited, mired place could exist made me hopeful. It still does. It had a timelessness to it. It was a humbling place, this fragrant bog. I understood that in some way, in the center of me, even as a thoughtless adolescent. It fastened to me, and I know that’s why I’m drawn to these kinds of places still, fifty years later. Under most circumstances, my brother and I wouldn’t have to wait long. Suddenly, there would be an insistent tug on the line. The feeling was unmistakable. It’s a strong pull-pull. It’s as if the crab is in a tug-of-war with you, and its pull is surprisingly strong. (There are many things about crabs that are surprising.) It’s resisting you. You sense purpose on the other end. Then whoever had the crab on the line would begin to pull the line up slowly and surely from the bottom, one hand reaching over the other to keep the upward motion going smoothly. The crab, greedy and oblivious, occupied with tearing off bits of the bait, is unable or unwilling to sense that it’s being pulled up from the bottom. It remains on the ascending line, nine out of ten times. Now, here was the moment we’d been waiting for. Very faintly at first, almost like an illusion, the blur of a form appeared. As it was being pulled toward the surface, it became more distinct, as if it were an image seen in binoculars that someone was adjusting to correctness. Then, there was the creature, a feeding crab, tearing at the bait even as it was being hoisted upward, often bigger than we were expecting, its back legs moving to keep it balanced. “Johnny! Johnny!” I’d whisper-shout to my brother. “Get the net!” My brother would fetch the net, a stringed, latticed pouch fastened to the end of a pole. He would move cautiously to where I was, careful not to rock the boat and send little undulations across and below the water that might scare the crab away. I would pull the line up even further. We could see the crab still eating, picking off tidbits from the chicken neck and inserting them rather daintily into its mouth, one bit after another, first with one claw while the other held onto the bait, then, switching jobs, with the other. Nothing looks like a crab. It’s so strange and wonderful-looking that even if you’ve seen hundreds of them, it’s still a surprise to see what the deep has produced. The crab is from another time in Earth’s history. It has eight legs in diminishing size from front to back and is a surprisingly agile and quick animal, even on land. It can use its two hinged claws extremely well, like a trained fencer, brandishing them in warning when you approach. If you’ve ever been bitten by a crab, you will always be wary around them after that. The bite can draw blood. They have two periscope bud-like eyes that can see sharply both in the water and out. If you are in doubt as to how well a crab can see, try moving your finger in its direction, even from behind, and watch its reaction. It was always at the moment when the crab came into watery focus that I would have a small sure realization about the different worlds of water and land. What followed was the only tricky part of crabbing—netting the crab. Sometimes a crab was so deeply engaged in its scavenging that you could even pull it out of the water and into the boat without a net. Most of the time, though, when you pulled it to the surface, if you weren’t quick enough with the net, the crab would drop off and flee. It’s very dispiriting to see a large blue-clawed crab swim away, sideways and down, down, down—gone. Such a beauty—lost. The netter, my brother in this case, would dip the net gently into the water two feet or more away from the crab. With the net poised just below the surface, he scooped it up directly under the crab and—got him! He would bring the prize up quickly from the water—a crab can escape a net sometimes, particularly if it isn’t completely inside—and deposit it into the bucket full of light brown lake water. The crab usually swam around in a circle furiously in the bucket for a minute or so until, resigned, it settled down. If it was a good day—and we had many of them back then so many years ago—we could fill our bucket up in an hour. Then it was time to pull the anchor free from the seething land and head back home with our bounty. We might have two dozen fat crabs in our bucket, stacked up upon one another—a good catch. There is no sight like a bucket full of large blue-clawed crabs. The sun’s flush on our bodies and our hair in disarray made us feel like warriors—or at least like men. We’d ease our boat slowly toward home, the insects screaming in the relentless heat, the boggy odor entering our noses and brains, the bow cutting through the nearly black unknowable water. Cite this Article: Richard Goodman “The Pull of Crabbing,” Hakai Magazine, Aug 24, 2015, accessed April 23rd, 2019, https://www.hakaimagazine.com/features/pull-crabbing/. 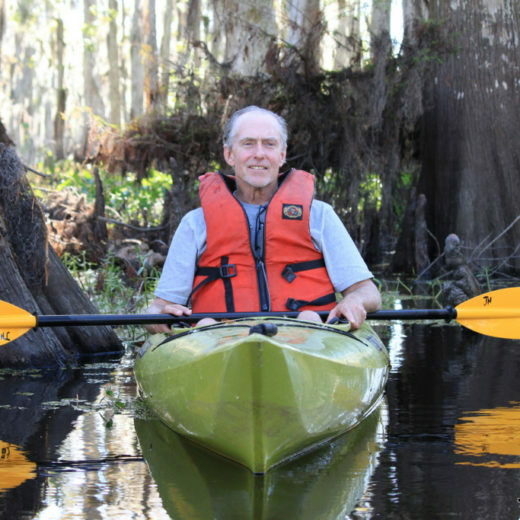 In the secretive world of Louisiana’s bayous, two kayakers look for the ivory-billed woodpecker and trade confidences about fathers, children, and growing old.